Richard Childress Racing in the NASCAR XFINITY Series at Indianapolis Motor Speedway … In 12 Series starts at the historic 2.5-mile speedway, the Welcome, N.C. organization has accumulated one win (Ty Dillon 2014), five top-five and nine top-10 finishes and led 27 laps. RCR averages a starting position of 8.8 and a finishing position of 7.4 and completed 1199 of the 1200 laps (99.9 percent) competed. Last Season at Indy … Ty Dillon recorded his first-career XFINITY Series victory at Indianapolis Motor Speedway last season. After qualifying third and racing inside the top five for the majority of the afternoon, Dillon got a jump on the race’s final restart on lap 77 to take the lead. Leading the final 24 laps, Dillon crossed the finish line first and recorded the No. 3 team’s first victory since September 2012 and Dillon’s fourth victory in NASCAR’s top three series. #Dash4Cash … After the first #Dash4Cash race at Dover International Speedway, RCR’s Brendan Gaughan had a fourth-place finish, qualifying him for the second #Dash4Cash race that will take place this weekend at Indianapolis Motor Speedway. The highest finisher of the four qualifying drivers (Brendan Gaughan, Regan Smith, Chris Buescher and Chase Elliott) at Indy will take home the payout of $100,000. Additionally, the #Dash4Cash winner from Indianapolis Motor Speedway, plus the top-three finishing drivers that receive driver championship points, will qualify for the third event at Bristol Motor Speedway in August. New Hampshire Recap … In the Lake Regions 200, Austin Dillon finished second and was the highest finishing RCR driver. 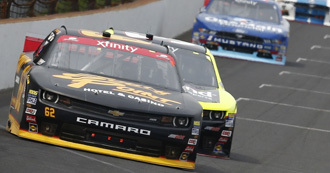 Ty Dillon, Brendan Gaughan and Brian Scott posted, sixth, 11th and 29th-place finishes, respectively. The Points … Ty Dillon is third in the driver point standings, Brendan Gaughan eighth and Brian Scott is 10th. The No. 33 RCR team is currently second in the owner point standings. Catch the Action … Coverage for the XFINITY Series Lilly Diabetes 250 at Indianapolis Motor Speedway will begin with both practice sessions on Friday, July 24 at 11:30 p.m. Eastern Time and 2:30 p.m. on NBC Sports Network. Qualifying will also be showcased on NBC Sports Network live on Saturday, July 25, at 11:30 a.m. and race coverage will begin at 3 p.m. on NBC. It will also be broadcasted live on MRN and SiriusXM channel 90. This Week’s Shore Lodge Chevrolet at Indianapolis Motor Speedway … Brian Scott will pilot chassis No. 164 in Saturday’s NASCAR XFINITY Series Lily Diabetes 250. This chassis from the Richard Childress Racing stable made its debut at Michigan International Speedway where Scott qualified second and finished ninth. Indy Statistics … In three XFINITY Series starts at the famed 2.5-mile speedway, Scott has an average starting position of 12.0 and an average finish of 7.7. His best showing was during the 2013 season’s event when Scott led in the closing laps and ultimately finished second. 2015 at A Glance … After 17 XFINITY Series races this season, Scott has captured two top-five, 10 top-10 finishes, sits 10th in the driver point standings and has led 133 laps with an average starting position of 5.5 and an average finish of 15.4. According to NASCAR’s Loop Data Statistics, Scott currently leads the XFINITY Series drivers with the highest average starting position of 5.5. Last Time in Indianapolis … Scott and the No. 2 Smokey Mountain Herbal Snuff Chevrolet Camaro qualified for the Lilly Diabetes 250 at Indianapolis Motor Speedway in the 10th position. Scott battled inside the top-10 for the majority of the 100-lap event at the historic track. On the final restart, Scott was scored 11th and gained four positions before taking the checkered flag to finish seventh. New Hampshire Race Rewind … Scott and the No. 2 Star Market/Kraft Velveeta Chevrolet qualified in the fifth position for the Lakes Region 200 at New Hampshire Motor Speedway marking his 12th top-five starting position this season. With 48 laps complete, the Richard Childress Racing driver was in the second position. Scott maintained second place through green-flag stops on lap 122. A four-tire stop on lap 140 restarted the team in the fifth position with 52 laps to go. With 35 laps to go, Scott encountered a mechanical issue ending his day early and resulting in a 29th-place finish. Double Duty … In addition to competing at Indianapolis Motor Speedway in the XFINITY Series this weekend, Scott is scheduled to drive the No. 33 Shore Lodge Chevrolet Camaro in the NASCAR Sprint Cup Series race on Sunday, July, 26. The Lily Diabetes 250 is live on NBC Sports Network at 3:30 p.m. Eastern Time on Saturday. The Brickyard 400 is live on NBC Sports Network, on Sunday at 3:30 p.m. ET. Meet Scott … Scott is scheduled to appear at the XFINITY Series autograph session at Indianapolis Motor Speedway in the Infield Pavilion on Saturday, July 25 at 10:00 a.m.
What is it about Indianapolis Motor Speedway that fits your driving style? "I feel like I understand Indianapolis Motor Speedway. A driver’s understanding of what leads to good lap times, how you need the car to be set up and to know how to pass at certain tracks is important. Indy is one of those places that seem to come to me naturally and we had strong runs right out of the gate there. That just added to my confidence and added to the team’s confidence. And it’s another one of those places like Kentucky Speedway where our RCR Chevrolets seem to be really strong and it fits our package well." This Week’s Bass Pro Shops/TRACKER Boats Chevrolet at Indianapolis Motor Speedway … Ty Dillon will pilot chassis No. 160 at Indianapolis Motor Speedway. This Richard Childress Racing-prepared Chevrolet Camaro has visited Victory Lane twice this season with Austin Dillon (Las Vegas Motor Speedway, Charlotte Motor Speedway). Ty Dillon will pilot chassis No. 160 for the first time this season at IMS. Dillon in the XFINITY Series at Indianapolis Motor Speedway … In two NASCAR XFINITY Series races at the historic Brickyard, Dillon finished third in 2012 and won last season’s Lilly Diabetes 250. The 23-year-old driver has an average starting position of 3.0 and an average finishing position of 2.0. Kissing the Bricks … Last July at Indianapolis Motor Speedway, Dillon held off Kyle Busch on the race’s final restart and drove the No. 3 Bass Pro Shops/TRACKER Boats Chevrolet Camaro to Victory Lane recording his first-career XFINITY Series victory. Dillon also won the Dash4Cash $100,000 bonus with the win. He and his family members, Richard Childress, Mike and Tina Dillon, Haley Dillon and Austin Dillon participated in the historic ritual of "Kissing the Bricks" on the finish line of the 2.5-mile race track and sprayed champagne with long-time sponsor and friend, Johnny Morris, founder of Bass Pro Shops. Bass Pro Shops continues partnership with RCR … Bass Pro Shops®, which specializes in outdoor fun, operates 93 retail stores and Tracker Marine Centers across America and Canada that are visited by more than 120 million people every year. Bass Pro Shops stores, many of which feature restaurants, offer hunting, fishing, camping and other outdoor gear while their catalogs and website serve shoppers throughout the world. For more information, and to shop online, visit basspro.com. New Hampshire Race rewind … Dillon recorded his 11th top-10 finish of the season last weekend at New Hampshire Motor Speedway in the No. 3 Wrangler Workwear/UniFirst Chevrolet Camaro with his sixth-place finish. The team qualified seventh earlier and remained inside the top 10 for a majority of the 200-lap event. Points Update … After 17 races, Dillon is currently third in the XFINITY Series driver point standings trailing second place by seven points. Meet Ty Dillon … Fans will have two unique opportunities to see the 23-year-old driver this weekend. On Thursday, Dillon is scheduled to throw out the first pitch at the Indianapolis Indians game. The game is scheduled to begin at 7:05 p.m. against the Scranton Wilkes-Barre RailRiders. On Saturday, July 25, Dillon is scheduled to appear at the Team Chevy Mega Stage located in the Infield Fan Midway at 10:45 a.m. for a question-and-answer session. You have a win and a third-place finish at IMS. What makes this a successful track for you? "Indianapolis Motor Speedway is one of my favorite places to race and we as a company have had a lot of success at this track. I think the biggest success factor is we bring the best horsepower to the race track with ECR Engines under the hood. Last season when we won the race, the horsepower we had on that final restart put me out front and we were able to take the checkered flag. Outside of that, our engineers and crew chiefs are very well versed with what we need to finish well here. I’m confident we will have success again here this weekend." What was it like kissing the bricks? "It was one of the best moments of my racing career, one that I’ll never forget. I think the best part of that afternoon was having my family with me to enjoy the moment. They were all so excited and happy for our team. It was a great day all around; we won the race, the Dash4Cash bonus and we had a heck of a race car." This Week’s Richmond/Menards Chevrolet at Indianapolis Motor Speedway … Paul Menard will pilot chassis No. 167 in the Lilly Diabetes 250 at Indianapolis Motor Speedway. This Richard Childress Racing-prepared Chevrolet Camaro is new for the 2015 season and will see track action for the first time during practice on Friday afternoon. Indy Details … The Eau Claire, Wis., native driver has made three NASCAR XFINITY Series starts at Indianapolis Motor Speedway, collecting three top-10 finishes. Menard has an average starting position of 9.3, an average finishing position of 6.7. The RCR driver also has recorded a victory at the historic 2.5-mile speedway in 2011 in the NASCAR Sprint Cup Series. Rearview Mirror: Loudon … Last weekend, the XFINITY Series visited New Hampshire Motor Speedway for the 17th race of the 2015 season. Austin Dillon piloted the No. 33 Rheem Chevrolet to a second-place finish after leading laps and battling a loose-handling race car. 33 Team by the Numbers … So far this season, the No. 33 team has accumulated some impressive stats with Menard, Austin Dillon and Brandon Jones. In 17 races, the RCR team has garnered three wins, five pole awards, 10 top-five and 14 top-10 finishes with 418 laps led. Looking Ahead … Following this weekend’s 100-lap affair, Brandon Jones will return to the driver’s seat of the No. 33 Chevrolet at Iowa Speedway for the August 1 event. This will mark Jones’ second appearance in the No. 33 car this season as he is slated to compete in three additional races. Double Duty … In addition to Saturday’s Lilly’s Diabetes 250 at Indianapolis Motor Speedway, watch Menard in the No. 27 Duracell/Menards Chevrolet SS in the NASCAR Sprint Cup Series The Jeff Kyle 400 at the Brickyard, which airs live on NBC Sports Network Sunday, July 26 at 3:30 p.m. Eastern Time. What are your thoughts heading back to Indianapolis Motor Speedway? "I practically grew up at the race track watching IndyCar races with my family, so Indy is one of my favorite tracks on the circuit. It’s always special to come here for me and my family. Danny (Stockman, crew chief) won the race last year with Ty so I’m looking forward to getting behind the wheel with him calling the shots on Saturday. Indy is the greatest track in the world to me, so getting a win in the XFINITY Series race would mean a lot." This Week’s South Point Hotel & Casino Chevrolet at Indianapolis Motor Speedway … Brendan Gaughan will pilot chassis No. 147 at the historic Indianapolis Motor Speedway. This Richard Childress Racing-prepared Chevrolet has been utilized this season at Phoenix International Raceway, Richmond International Raceway and Iowa Speedway. Chassis No. 147 averages a starting position of 12.0 and finishing position of 9.7. Gaughan’s Brickyard Stats … Gaughan is scheduled to make his second NASCAR XFINITY Series start at the 2.5-mile speedway this weekend in the Lilly Diabetes 250. #Dash4Cash … After the first XFINITY Series #Dash4Cash race at Dover International Speedway, Gaughan had a fourth-place finish, qualifying him for the second #Dash4Cash race that will take place this weekend at Indianapolis Motor Speedway. The highest finisher of the four qualifying drivers (Brendan Gaughan, Regan Smith, Chris Buescher and Chase Elliott) at Indy will take home the payout of $100,000. Additionally, the #Dash4Cash winner from Indianapolis Motor Speedway, plus the top three finishing drivers that receive driver championship points will qualify for the third event at Bristol Motor Speedway in August. Just Passed Halfway … Leading into the 18th event of the 2015 XFINITY Series season, Gaughan averages a starting position of 8.6 and a finishing position of 14.4. The Las Vegas native and the No. 62 RCR team have accumulated two top-five finishes, eight top-10 finishes and led 10 laps. Gaughan has earned 679 quality passes and 51 fastest laps. In the Rearview Mirror: New Hampshire Motor Speedway … Gaughan and the No. 62 South Point Hotel & Casino Chevrolet qualified 10th for the Lake Regions 200 at New Hampshire Motor Speedway. The Las Vegas native began experiencing loose-handling conditions early in the 200-lap event. During the third caution, Gaughan came to the attention of his Shane Wilson-led team. The Richard Childress Racing team elect to changed right-side tires, received a full tank of fuel and made a track bar adjustment. Gaughan restarted 11th and raced in that position for the majority of the afternoon. Green flag pit stops put the No. 62 RCR Chevrolet a lap down, forcing them to race for the Lucky Dog position. On lap 166, Gaughan was the recipient for the Lucky Dog award and earned his spot back on the lead lap in the 11th position, where he would ultimately cross the finish line. Last Year at Indy … The South Point Hotel & Casino Chevrolet started last season’s Lilly Diabetes 250 at Indianapolis Motor Speedway in the 17th position. With the threat of a mechanical issue early in the race, crew chief Shane Wilson took advantage of the first caution and brought Gaughan to pit road to evaluate the situation. The No. 62 Camaro restarted 31st and the Las Vegas native battled to overcome the early issues throughout the day. Gaughan crossed the finish line in the 19th position. To the Points … As the Series heads to Indianapolis Motor Speedway, Gaughan and the No. 62 South Point Hotel & Casino team is eighth in the driver point standings. Meet Gaughan … The Las Vegas native is scheduled to participate in the XFINITY Series autograph session beginning at 10 a.m. on Saturday, July 25 at the Infield Pavilion. What are your thoughts on racing at Indianapolis? "Luck hasn’t always been on my side at Indianapolis Motor Speedway, but I am really looking to change that this year. I can’t tell you how excited I am to return with Richard Childress Racing equipment and ECR Engines. The team and I are really looking forward to getting on track at Indy and being eligible for the $100,000 Dash4Cash bonus."